The two free scrapbooking layouts below are from Twas the Night Before Christmas Story Book Scrapbook collections found at: www.TwasTheNightScrapbook.com. Just right click on either image and "Save Target As.." to save to your computer. If you just click on them, they will open in a new window and you can use your "File" "Save" menu to save them as well. Right click to download Free christmas scrapbooking layout1. Right click to download Free christmas scrapbooking layout1. The following 3 free scrapbooking layouts are from the new Baby Book Scrapbook collection. found at www.babyscraps.com. Right click to download Free baby scrapbooking layout1. Right click to download Free baby scrapbooking layout2. Right click to download Free baby scrapbooking layout3. 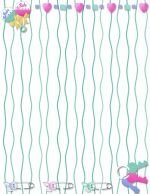 Here are some more free scrapbooking layouts courtesy of Princesscrafts.com.